These notes will discuss how a critical and theoretical background informs and relates to my studio practice. This background is broadly concerned with issues of abstraction and representation in painting. I am concerned by questions about the rhetoric of painterly pictorial structures, painting as a specific medium, the history of its transformations and its polemical positions. An important and recurrent theme will be the relationship between cultural hegemony and painterly abstraction in terms of questions of signification. 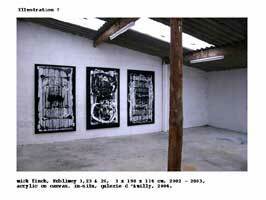 Between 1994 and 1996 I made a series of paintings entitled Closer Than You Think. This series was set against a particular critical perspective about questions of painting and medium within a more general cultural and historical context characterised by issues of hegemony. The discursive focus for this was the critical polemic between Clement Greenberg’s high modernity and Minimalism, particularly in terms of the work and writings of Robert Morris and Donald Judd. As Michael Fried has pointed out, Minimalism was in many ways the logical conclusion of much of Greenberg’s thinking (1). Morris and Judd found the weaknesses in Greenberg’s ideas about medium and a pictorial condition. With relative ease they were able to undermine what some would see as Greenberg’s conservative idea of painting. In turn they constructed another formal position around a categorical hybrid of the art object which was “not painting, nor sculpture” but specific objects (2). The polemic here was between a reductive dynamic in Greenberg’s thinking around an absolute and specific idea of medium, which was in contrast to the expanded, and relational idea of the art object and its context in Minimalism. This moment in the history of the Modernist avant-garde seemed to me to be crucial when thinking about painting within a contemporary context. Minimalism not only delivered a decisive blow to painting’s previous centrality in the Modernist project but also determined the basis for an artistic practice within an expanded field rather than in terms of a specific medium. In addition to this, Judd made a distinction between the American and European context. The part-by-part functioning of compositional works of art he saw as being an ‘objectionable European relic’ (3). In contrast he saw the best recent American art as being characteristically non-compositional, externalising, relational and dynamic. 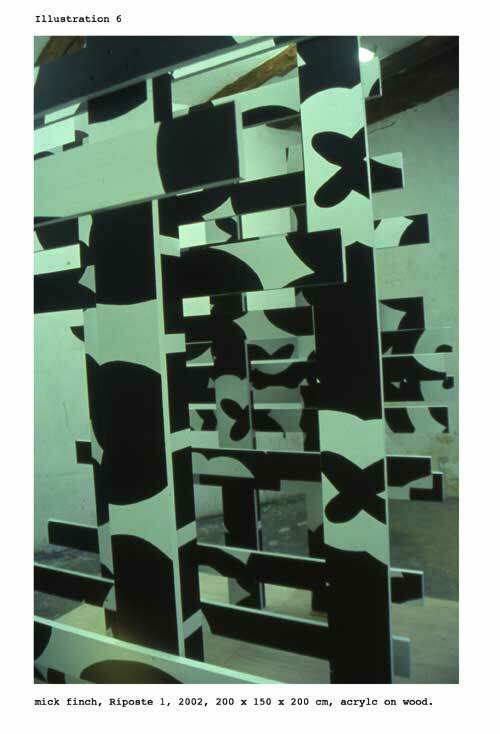 This contrast between the internalised/compositional and externalised/non-compositional qualities led Morris to develop his ideas around a perceptual relationship to shape. 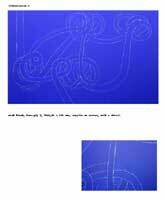 By applying the distinction between composition and non-composition one stage further, Morris arrived at a distinction between complex and unitary forms. A complex form required that the spectator disassemble it and understand it in terms of its parts. The spectator’s understanding of simple or unitary form is, in contrast, immediate being driven by the form’s gestalt and requires no such part-by-part reading. This gestalt effect for Morris is what he understood as being the motor pushing the spectator’s reception of the work within a situation. To compound this quality, Minimalist art tended to be organised, exhibited and installed around grid-layouts prompting an a priori reading of the work by the spectator. The resulting installation can be thought of as a ‘situation’; a totalising work that even includes the spectator. My practice used this conjunction as a pretext for a group of paintings that used both the visual syntax of the Disney adverts and a rhetoric of painterly abstraction. 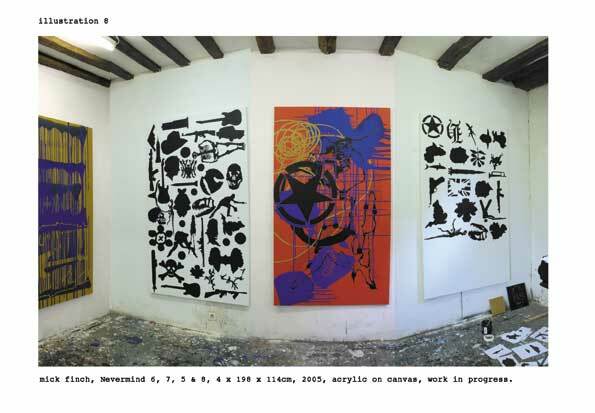 Grids, framing devices, dripping and gestures were all used in conjunction with fragments of the Mickey Mouse image. 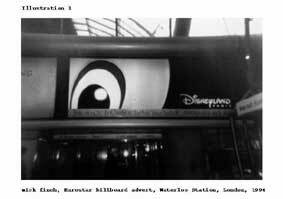 What had struck me in the Disney adverts was how efficient they were as gestalts. With very little visual information the whole image could be decrypted suggesting that Mickey was a highly pervasive image if not a ‘unitary form’. I laid the fragmented Mickey image into grid systems, used it as a repetitive motif and stencilled and imprinted it into painterly grounds. Networks of paint drips were used to mask and uncover these images within a regime of visibility and invisibility. The aim here was to use painting’s rhetorical history and syntax as an intervention within its critical demise as a medium. This was not so much to make a case for painting but more to recuperate and assert its critical specificity. The paintings in this series explored a very distinct objective. 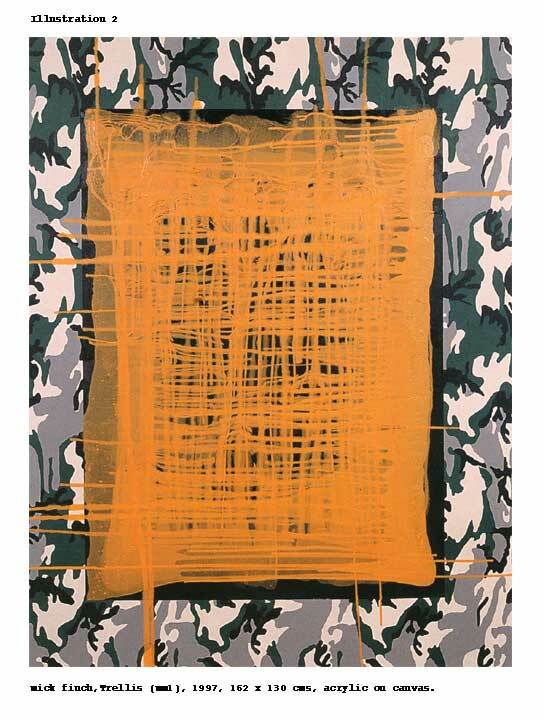 Trellis (MM1) (see illustration 2) used camouflage as a border within which a thick painted ground had a Mickey Mouse image repeatedly imprinted into it. The tension between the invisible and the visible in Trellis (mm1) produced an insidious reading; something hidden and material at work within the representation transforming merely incipient elements into something apparently subject to ideological effects. The objective throughout the Closer Than You Think series was to situate the spectator within a painterly strategy whereby vigilance and interrogation of the painterly scene is essential. (9). The emphasis was upon painterly syntax and rhetoric combined with culturally specific material that is embedded into the structure of the tableaux. ‘For the picturesque is above all a struggle against the reduction “of all terrains to the flatness of a sheet of paper”…’(14) Thus, as with absorption and anti-theatricality, parallax effects and the picturesque can be seen as being rhetorical devices that are at odds with the a priori effects of the gestalt mechanisms of minimalism. The relationship with the picturesque will be developed later. used a technical development that occurred during Closer Than You Think where I started to use masking tape. I found that a small vestige of paint leaked under the masking tape and that this could be active as a way of ‘re-grounding’ sections of a painting. 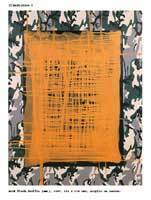 In the Ply-ground paintings the Mickey Mouse, camouflage and paint drip systems were inscribed into different linear networks weaving over and under each other. The first of these paintings had a black ground and the line networks were masked up with a first coat of white paint followed by black and then over-layed with a motif. When the tape was removed there would be the vestige of white paint around the entire line network. In Mono-ply this same process was applied but without the motifs. The sense here of each network being re-grounded into the painting was fore-grounded here. The Mono-ply paintings were monochromes in all except the white halo around each line network signalling the paintings primed undercoat. 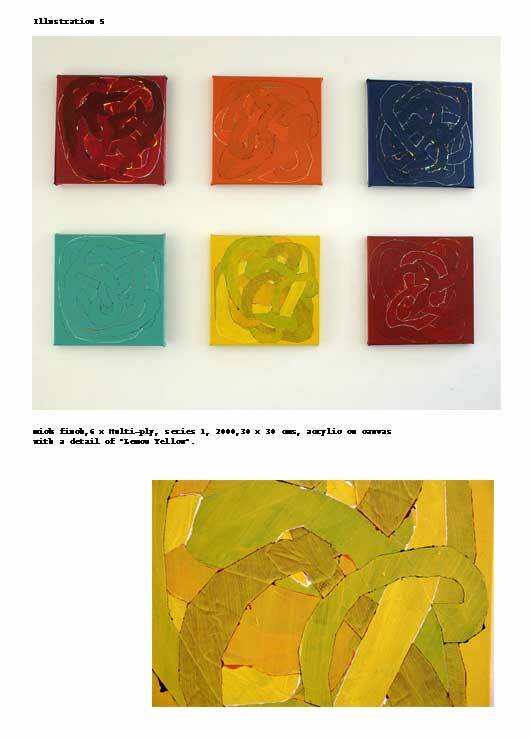 In Multi-ply the paintings were made in series of six, each of the six paintings having a different coloured ground. In each painting there were five line networks, woven into each other. 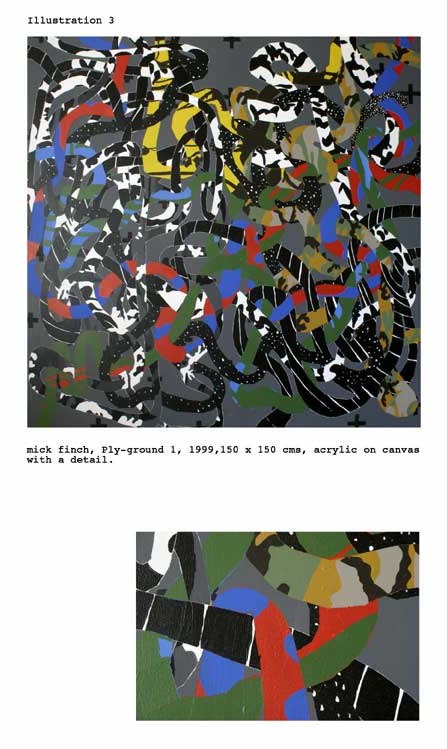 Each network used a first coat of a colour from the other paintings in the series, with the second colour the same as the painting’s ground. The sense throughout these works has been to use the painting’s materiality and construction to displace the spectator into a series of readings. The principle here is that of a kind of parallax effect most pronounced in the Ply-ground series where each ground network would have a different motif inscribed within it. In Multi-ply the colour coding of each ground acted as a displacement between the different paintings. These works were also made upon the flatness/thickness critical axis and with Mono-ply and Multi-ply the reductive aspect of painting as monochrome was brought into question. The sampling and grabbing of images for Sublimey has become a process in itself. The different categories of images have brought into play distinct pictorial mechanisms that have been a result of the rhetorical qualities of the images. Sublimey 3, 23 & 26 (see illustration 7) uses head forms, in this case the silhouette of a monarch, Elizabeth II and two skull images. My intention from Closer Than You Think to Sublimey and now to Nevermind (see illustration 8), has been to position the spectator within an active relationship to the paintings. By locating the image within a visual and pictorial rhetorical regime, the tableau offers up its apparatus to the spectator in order to give them a sense of the work working. To sum up, I see the background I have laid out here as a sort of ethic of making and representation. This regime does not mitigate the demands of the daily practice of painting; the trial and error, the accidents and intuition. not to mention the success or failure of a work. 1. 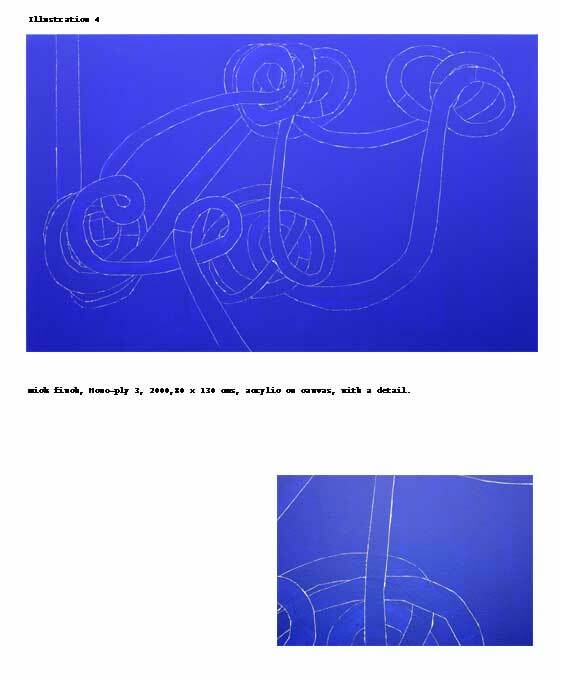 Michael Fried, Art and Objecthood, University of Chicago Press, Chicago and London, 1998. pp 33 – 40 also in Art in Theory 1900-1990, Blackwell Oxford UK & Cambridge USA. 2. Donald Judd, Specific Objects, in Judd, Complete Writings, Halifax Nova Scotia,1975 also in Art in Theory 1900-1990, Blackwell Oxford UK & Cambridge USA. 6. Yve-Alain Bois, Painting as Model, Cambridge USA, 1990, in Introduction: Resisting Blackmail, pp xi – xxix.